Baltimore, MD—October 10, 2018 – Millon Events and JTAA Lacrosse is excited to announce the inaugural Jupiter Lacrosse Classic. 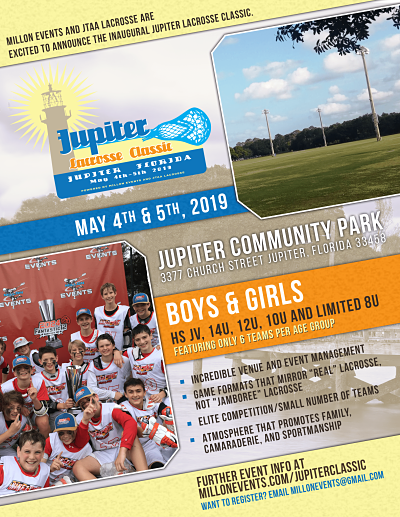 The event will be held May 4th and 5th, 2019 at the beautiful Jupiter Community Park and positioned as the ultimate boys and girls lacrosse event in the South. The event will be a great kick off to summer and geared towards the player and family experience as well as a celebration of the sport of lacrosse in Florida. Highlights will include a combination of impeccable fields, elite level teams, well trained officials, and best-in-class event management. The small boutique style event will feature desirable game formats that look like true lacrosse games with quarters and timeouts rather than the standard running time and halves that the large tourney operators use for simplicity. Camaraderie and sportsmanship will be a heavy focus and the family experience will be second to none. The event will be open to boys and girls teams at HS JV, 14U, 12U, 10U and limited 8U and will feature only eight teams per age group. “We are very excited to partner with the JTAA on the Jupiter Lacrosse Classic. The event is going to be a world class competitive lacrosse event in one of the most beautiful parts of the country. The events we have done the past few years have been all about creating an atmosphere that promotes family, camaraderie, and sportsmanship. The feedback from the teams and participants has been overwhelming. I’m really confident the teams, players, families, coaches in Florida will feel no different and are going to love it. ”said Mark Millon, Millon Events COO. The Jupiter Community Park is located in beautiful and historic Jupiter, Florida and sits on 94 pristine acres and features ten immaculate Bermuda grass fields. Also on site are restrooms, playgrounds, and ample parking and many hotels are located in close proximity. The event will begin with Saturday pool play which includes two pools of four teams each at each age group. Teams will compete in three games of pool play vying for advancement into the Sunday Championship format. Day two will feature a playoff format of four teams with a champion being crowned Sunday afternoon, with consolation games being played throughout the day. Every team will play a minimum of four games.